BROOMFIELD, Colo.--(BUSINESS WIRE)--Brother Mobile Solutions, Inc. (BMS) a wholly-owned subsidiary of Brother International Corporation and premier provider of mobile and desktop thermal printing products, has forged a partnership with Blackbay, a leading provider of mobility-enabled solutions for the transportation and logistics industry. Blackbay identified Brother RuggedJet™ 4” mobile printers for use with its proof of delivery applications. The two companies highlighted their solutions at Transforum 2014, TMW Systems’ annual user conference and exhibition, September 21-24 in Nashville, Tennessee. Brother RuggedJet printers are tough, road-tested products that allow drivers to print clear, legible thermal receipts, labels and tags. RuggedJet is the first mobile printer in its class to be Apple AirPrint certified, ensuring that the printers perform seamlessly with iOS® devices (including iPad and iPhone) in addition to Android™, Windows® Mobile and Windows® based smartphones, handhelds, tablets and laptops. RuggedJet printers are extremely easy to use and maintain in the field, and come backed by one of the industry’s best standard warranties. RuggedJet is engineered to handle the rigors of day in and day out mobile distribution, with IP54 certification to withstand dust and moisture, and up to 6 ft. drop protection. 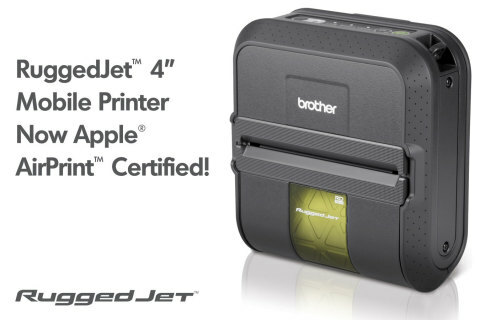 For additional information on Brother RuggedJet Mobile Printers, please visit: www.brotherruggedjet.com. Blackbay is the leading provider of mobility enabled solutions for the transport and logistics industry. The company’s configurable end-to-end solutions ensure first time, on time, every time delivery by connecting the shipper, operations, management, drivers and crucially the customer with real-time information and flexible workflows to create smarter delivery companies. Blackbay, headquartered in London, operates across APAC, EMEA and the USA, supporting over 145,000 drivers delivering in excess of 6 million deliveries per day. Brother Mobile Solutions, Inc. is a wholly owned subsidiary of Brother International Corporation which had revenues of approximately $1.7 billion in fiscal year 2013. Brother International Corporation and its subsidiaries employ over 1,100 people in the Americas. For more information, visit www.brothermobilesolutions.com. *iPhone®, iPad® and AirPrint™ are trademarks of Apple Inc., registered in the U.S. and other countries. Use of these trademarks is subject to Apple permissions. Requires connection to a wireless network. See support.apple.com for system requirements.